Muralist Creates Incredible "Nipsey Hussle Memorial Basketball Court" In South L.A.
Home>Music> Muralist Creates Incredible "Nipsey Hussle Memorial Basketball Court" In South L.A. The court will open this weekend. It was recently announced that the intersection of Crenshaw Boulevard and West Slauson Avenue may soon be officially recognized as "Ermias 'Nipsey Hussle' Asghedom Square," and to continue building up the community that the rapper loved so dearly, a new basketball court with his image was created. 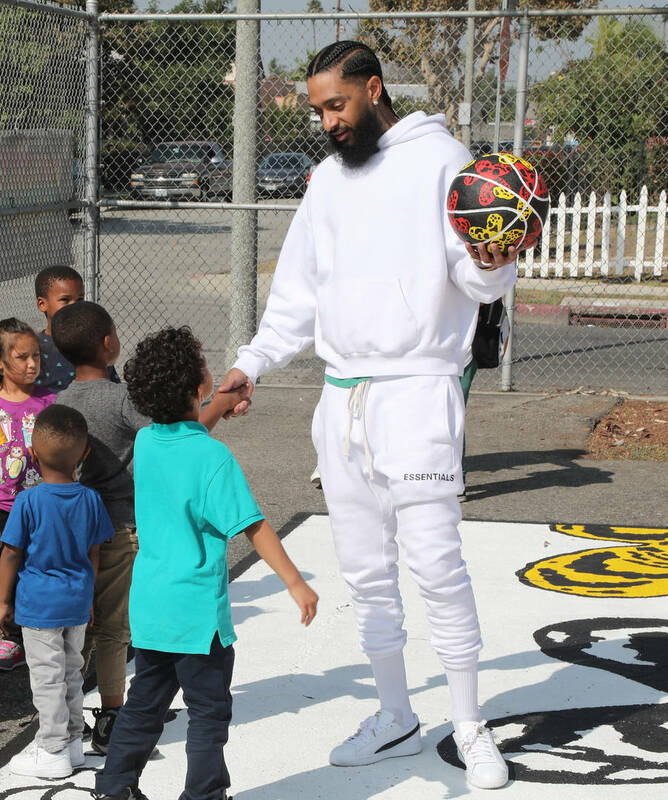 Nipsey worked with the youth in the Hyde Park district of Los Angeles, so it is fitting that the Nipsey Hussle Memorial Basketball Court would be painted outside of the non-profit charter school Crete Academy, located on Crenshaw Boulevard and 60th Street. "His legacy will live on and his spirit lives forever," said Nick Ansom, CEO of the Venice Basketball League, which spearheaded the project. The court is slated to be opened during a ribbon-cutting ceremony on Saturday. "He spoke through his music, but he also spoke through his actions," Ansom continued. "You have Nipsey [at mid-court] looking out toward his neighborhood and saying, 'I'm still here with you guys.'" The mural 46 feet wide, 78 feet long court was painted by muralist Gustavo Zermano who began the project by using a stencil in the center and working his way outward. "When [Nick] asked me to be a part of this, I felt like I had to contribute something bigger, so that's when I pitched the whole Nipsey thing, like actually painting him on the court," Zermano said. "He was a big part of helping the kids, and when I heard it was at a school that's when I was like, it's for real." NBC4 Los Angeles captured a helicopter view of the court and shared the video on their Instagram page. They captioned the clip by writing, "Nipsey Hussle's love of basketball and the community where he grew up meet at the corner of Crenshaw Boulevard and 60th Street, the site of Nipsey Hussle Memorial Court. The court, which officially opens this weekend, was a dream that @VeniceBall helped make a reality with inspiration provided by the beloved slain rap artist and community hero." MUSIC Muralist Creates Incredible "Nipsey Hussle Memorial Basketball Court" In South L.A.